Did you know that Fall Creek Falls state park is one of the best places in Tennessee to view the night sky? Neither did I, until a couple of weeks ago. Up a paved road near the inn is a large open area where, several times a year, astronomy enthusiasts gather to share their love for planets, constellations, exploding stars and distant galaxies. On May 6, during the dark of the moon, I joined them. I’d just finished reading Douglas Adams’s 1979 cult classic “The Hitchhiker’s Guide to the Galaxy,” which deserves a column all its own, so I was especially excited about having the chance to learn more about our amazing universe. There were plenty of people at Fall Creek Falls eager to teach me. On this weekend when the moon wasn’t visible, dozens of folks had congregated to study the night sky. And to share their telescopes—some as big as Civil War cannons—and their binoculars, star charts and knowledge with anyone who was interested. Flashlights were allowed, though they had to be pointed at the ground and wrapped in red cellophane. The viewing area wasn’t cave-dark (a condition that can only be achieved in—cough, cough—a cave), but it was pretty darn close. The little town of Spencer is northwest of the park and throws off some light, as does the little town of Pikeville to the southeast. But in spite of those “city lights,” the night was impressively dark. So dark, in fact, that I couldn’t tell much about the people I was talking to. They were just vague shapes and soft voices, which was very cool. I remarked on this to the first guy I struck up a conversation with. He told me it was too bad I couldn’t see him because he was very good-looking. I told him I was, too. In fact, I said, I was runner-up to Miss America a couple of years ago. We laughed. Then he invited me to look through his telescope, which I did. I saw several constellations and Venus, closest planet to the earth and very, very bright. Best of all was getting to view the colorful stripes on Jupiter, our solar system’s biggest planet. Everywhere I stopped, people were eager to chat and to share their equipment and expertise. After I made my rounds, I settled into the folding chair I’d carried up the hill, wrapped a blanket around my shoulders and gazed at the sky until it became too overwhelming to take in. The same questions that haunted me as a child haunt me still. What is man that thou art mindful of him? What is infinity? Is anybody else out there? If not, why not? If so, where are they? Do they look like us? More than that, do they behave (and misbehave) like we do? Alas, no answers came. But I can’t imagine a better place to ponder those questions than that dark, dark hilltop at Fall Creek Falls. 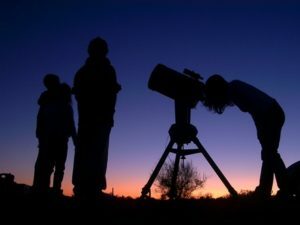 If you’re interested in attending future astronomy weekends (June 3-4, July 1-2, August 5-6 and the Fall Star Gaze on September 30), you might want to arrive well before nightfall to take advantage of some of the other attractions the park offers. I walked to the Cane Creek Falls overlook, which has as breathtaking a view as any I’ve seen anywhere. Then I ventured out onto the nearby swinging bridge, which is tons of fun and not at all scary even for someone afraid of heights. After that, I went to the all-you-can-eat buffet at the inn and sampled fried frog legs for the very first time, only to discover that what I’ve always heard about them is true. They taste just like chicken.